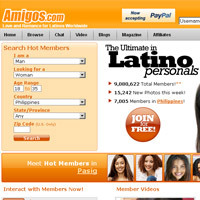 Amigos.com has been designed to target the Latin dating market. The site does rather well in most areas, but that doesn’t mean it doesn’t have its limitations too. Straightaway the biggest drawback is that before you pay, your ability to look at members’ profiles is extremely limited, which is very important when deciding to join a site. However, there are so many other features to try out that you may feel like it all balances out to something worth trying. We’ll start with something positive about Amigos, although that all depends on where you live. If you live in the United States you can search profiles for free by zip code. If you live outside the US, including any of you living in Canada, you’ll need to upgrade your membership in order to do localized searches based on your city. Otherwise, you can only search by country, state or province. You’ll be able to see the last login dates on all your free search results. Now, we come back to the real problem for unpaid guests. You might be able to see a few members’ full profiles, but it’s completely hit or miss. It seems that only if someone has paid a special fee in addition to their premium subscription will you be able to view their full details. Some of their additional photos will still be blocked though. Other than that, some very popular profiles become viewable by everyone, which is incentive to really put your all into creating a profile. Free members can initiate contact with some premium members. The extra “standard contacts” option lets paid subscribers receive messages from unpaid members. It also allows unlimited replies to any message they send. Normally, free subscribers can only reply to 10 emails per 24-hour period. At any rate, whatever you choose to pay, all members can reply back. Contact options and community interaction on the site is extensive. There are chat rooms and instant messaging, both of which can be used by free members. Free access might have a certain daily usage limit, but it’s not clearly explained. There are personal blogs and a magazine with member-submitted articles. The “groups” section is really just an interactive message board system. I saved the best till last. The price to join is so low and its popularity so high that it makes up for any complaint we might have. You might not have a chance to try it out completely before joining, but you’re risking little if you join anyway. Amigos is so popular and affordable that you have nothing to lose by giving it a try.